Home › Abundant Living › So Really…Why Do Bad Things Happen? So Really…Why Do Bad Things Happen? An innocent 9 year-old girl is plowed into by a 240 pound errant skier on a beautiful Lake Tahoe morning. She tumbles down the mountain and is bleeding from her ear, nose and mouth and semi-conscious when her parents reach her side. Rushed down the mountain by the ski patrol and then a harrowing ambulance ride to the emergency trauma center, she’s rushed into hours of brain surgery fighting for her life. Her shocked young family look on helplessly. We’ve all asked the questions: Why? Where was God when ________? or Why did God allow ________? You can easily fill in the blanks. We’ve asked these questions when we see tragic events in the world as well events that strike us personally. There’s no shame in these questions. They are normal and even beg to be asked. It’s the answers that get confusing, although they need not be. The confusion comes from our own personal image of God in the larger context and our perspective on the distribution of evil and suffering in the world. 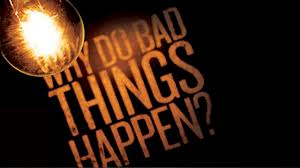 Can the Bible really address this question of Why do bad things happen? The answer is Yes and comes packed even with wonder and peace that can bring comfort in the midst of our breaking hearts. Most people have a standard image of God as all wise, powerful and good. We’ve read or heard the Scriptures that say “He is great in power and justice.” (Job 37:23), “His power who can understand.” (Job 26.14), “That power of God…called Great.” (Acts 8:10), “No one is good but God alone.” (Mark 10:18), “O how abundant is thy good.” (Psalm 31:19). Many leave it at that and feel we’re but pawns under the authority of “the great and mighty Oz.” Or else He is like a Holy Parent Figure who will reward and protect us (and the world) if we’re good and obedient, or punish and discipline us if we’re disobedient? We get what we deserve. While they might not admit it, many Christians allow a bit of karmic justice into their theological rationale. At the same time, many see Man as inherently good and therefore able to overcome evil in the world with social effort, good intentions, shared resources, happy thoughts, or pick your favorite societal solution. When we add Man’s effort to a “good and loving God” we get a recipe and outcome expectation that is constantly frustrated and disappointed with what we see around us every day and over the course of human history. What’s missing here? Why does it not work the way we believe it should? Indeed, why do bad things happen (even to people with good intentions)? The answer is not the simple explanations that “God is testing us” or even that “our suffering is beneficial to us.” It really comes down to our perspective and worldview (see 4/20/13 post, God, Boston, and Your Worldview). There is a larger story or narrative being played out. God is all wise, powerful and good. He created everything and through love, allowed freedom of choice in the angelic and the human realm. Satan and Adam chose poorly and ushered in evil and darkness into all human lines. That’s the world we’re living in. Broken, sinful and dark, but with a redemptive resolution through the incarnation of God in Christ, the God-Man (see 2/8/13 post Jesus, the Word and God-Man). There is choice but purpose in a world that doesn’t always make sense from our positional view (see 1/4/13 post Habakkuk’s Question and 3/16/13 post Job – the Book No One Finishes). With the Biblical perspective that your life-play is on a larger stage with purposeful roles that are but small steps into eternity, we can weather storms, trials and tragedies, while even devastated. I was standing next to my daughter on the slope when the skier hit her with full force in the head. While my wife went down the mountain with the ski patrol, our injured daughter, and our 6 year-old son, I rode a ski lift to another part of the mountain to pick up our 12 year-old son and his friend where we were going to meet for lunch. I had a lot of time alone to think and pray. My memory is vivid in surrendering my daughter into God’s hands. I recall specifically praying “Lord, if Lisa dies, this would be a tragedy. Please spare her life. But Your will be done here, not mine.” My next thought and prayer was for us to somehow get the word out to others to pray for Lisa. That my wife’s Bible Study Fellowship leader just happened to be at that same ski resort, and from 30 yards away noticed my wife next to a crowd surrounding an ambulance loading my daughter, is the stuff of legends and miracles. She prayed over my daughter and then started a network of prayers throughout the bay area. My daughter suffered a subdural hematoma and spent 5 days in critical care. Today, at 27, my daughter is a vibrant young wife and mother and a living testimony to God’s breath of life (see 10/19/13 post A Wife’s Prayer for Her Husband). For us, that episode changed our family and my own perspective on life, death, purpose, destiny, dependency and submission to God’s will rather than our own. Why these things happen will always be a mystery of sorts, but knowing that even in tragedy and darkness we are near the hand of God is to understand much on this side of eternity. Are you at peace with the trials in life? It seems that many of these stories told to exhibit a point or teach gospel end on a happy note. Those who survive have a nice packaged theory about God to go along with their happy outcome. What of the people whose outcomes have been more drastic? I wonder, in this case, if this father would have developed a different theory? Kathryn, thank you for a fair and thoughtful question. I’d point out that the Boston bombing did not have a happy outcome, nor did Habakkuk’s situation (he lived to see the demise of his homeland). You can say Job finishes well but with pretty bitter medicine. Yes, my daughter survived and we were greatly blessed. If my daughter had died, as per my prayer, I would have had to live with the tragedy and the knowledge that God did not answer our prayers and requests in a way we would have scripted. But His Will trumps my own will or requests. My “theory” would have been the same: that God is in control and knows things that we do not. That this world is broken and in need of redemption and indeed sometimes bad things do happen. We may petition Him but He’s God and we’re not. How we deal with tragic outcomes is really a function of our trust in Him and His Word, which presents a clear case that this world and life is but temporal and only part of a larger story.